Bin Trim is a simple tool to help businesses measure their waste, and find out how to waste less and save more. Why use the Bin Trim tool? 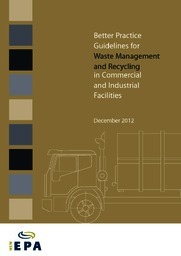 What types of waste does Bin Trim apply to? Bin Trim can be used for all types of business waste including office waste, food waste, plastics and general mixed waste. This tool can be used with MS Excel 2003, 2007 and 2010 for PC. Note that the tool does not work with Apple Mac versions of Excel. When you open the Excel file, depending on your operating system, you may need to select 'Enable macros', ‘Enable editing’ or ‘Enable content’. Follow the on-screen prompts. Enter your business details and information about what goes in bins and what gets recycled. Complete a simple waste survey to find out the volume and types of materials you are throwing in your waste and recycling bins. You can access this survey via the Bin Trim tool, or download the survey sheet separately: Bin Contents Survey Sheet (PDF 232KB). Select the materials you would like to include in your action plan to reduce waste and increase recycling.